Part of my coaching practice is helping clients to move behavior from the “automatic” to the “aware” parts of their brains. There is plenty of scientific research supporting the neurological basis of our behavior. We can, indeed, make choices that change our thinking and thus alter the structure of our brains. Change happens when there are two forces at work – a pull toward a new way of being and a push away from the old way of being. If a client is not positioned with both a push and a pull, changes are unlikely to last. If you are unable to recognize your own bothersome behavior when it is happening, then you are operating at the unconscious level of awareness. To change your circumstances we first have to guide you into a safe, conscious awareness of your behavioral choices. If that sounds scary, don’t worry, it is natural to be afraid to learn about or admit to behavior in ourselves we don’t like. That same system in our brains that keeps it hidden from our awareness is instinctually motivated to protect our sense of self. 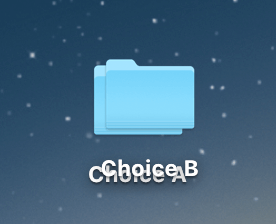 If you have an internal conflict, it is like having two computer files where the desktop icons are stacked one over the other. There could be stacks of these “files” on your “desktop” offering unclear or conflicting information. When you click a “file” with your metaphorical mouse, it is difficult to determine which “file” has been selected. Since it is unclear what is going to happen, nothing happens, or worse, the “wrong” thing happens – a behavior you don’t wish to express. We can separate conflicting ideas using coaching conversation. Once the ideas are separated you can clearly choose which “file,” or behavior, you want to use. Humans have amazing brains that can fantasize, daydream, think in the abstract, solve imaginary problems, and synthesize and create tools. This is how we are separated from other animals. Because we have such amazing ability to hold a paradox in our own minds – contradictory beliefs – we run the risk of being “stuck” between competing ideas. We can believe we are a “go-getter” yet only pursue goals that have no tangible rewards. We can want to do an activity and not want to do an activity simultaneously. These paradoxes are a sign of a healthy mind. It just demonstrates that a healthy mind can also become confused by conflicting beliefs or desires. When we are in a coaching session, I pay special attention to the client and where they seem “stuck in paradox.” Often they are coming to be coached because they know a change is desirable, yet “something” is holding them back. While exploring behavioral paradoxes there are clues that come from the unconscious that either support or refute what is being communicated on the surface. The first phase is to determine actual desire for change. What are the motives for change being brought up by the client and do any of those motives reveal a dimension of paradox? I like to share a paraphrased version of a story told by one of the great therapists, Dr. Milton Erickson. The full story appears in the Collected Papers of Dr. Milton Erickson, Volume 3, and is actually about a stubborn calf, however I think we can all relate to the stereotype of a stubborn donkey for the purpose of this blog post. It is excerpted in the Wikipedia page about Dr. Erickson as well. The gist of the story: A farmer is attempting to pull a stubborn donkey into his barn. Young Milton, who grew up on a farm, sees the farmer struggling to force the donkey to budge. The scene is funny and it makes Milton laugh out loud (much to the irritation of the frustrated farmer). Milton offers to help the farmer, and carefully ties a rope to the donkey’s tail. They both pull at the same time and now the donkey HAS to choose, so it goes the direction it knows the most about – forward. The important part is the donkey was no longer simply resisting change. Once it knew there were two ways to go (or two ways to resist) it had to choose one. When you want to get unstuck from a stubborn paradoxical (or oppositional) thought – the desire for change must be accompanied by a dis-incentive for staying still. Not choosing is a hidden choice. A valuable NLP visualization technique is imagining that same computer desktop we described earlier with a magical mouse that can click stacks of material and separate them out over the surface of the desktop. Each concept (or “file”) is examined then sorted into the correct location. The first step to getting unstuck is revealing ideas mixed in with concepts headed in the opposite direction from your goals. This must be done permissively. I use the phrase “Change is Permitted” as part of the preparation for the exercise. This sets the stage for the subconscious allowing change to happen because it is “authoritatively permitted” by an imaginary sanctioning body (in this case an agreement between client and coach). Once the client has separated out all of the stacked “documents” and sorted them, the oppositional beliefs will be apparent. We will move them to a new location to save for a future behavioral choice (or put in the trash to “delete” later as they are “taking up space” and are not useful). Place the “trash bin” on a “timer” that throws out unwanted behaviors when not used within a few days or weeks. It is critically important that you, the client, are doing the work. It unveils where unconscious conflict is preventing growth. Does this sound like you? Coaching can help.